Our podcast guest for episode 2 is Jason Howard, General Counsel and Chief Compliance Officer for Spotlight Asset Group. On this episode Jason tells us how to choose a Financial Advisor and what questions you should consider when looking for a Financial Advisor. Aaron: This is Aaron Kirsch, Managing Director at Spotlight Asset Group. 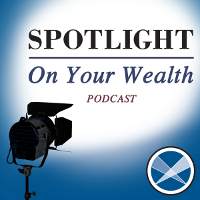 Welcome to Episode 2 of the Spotlight On Your Wealth Podcast. Our guest today is Jason Howard, General Counsel and Chief Compliance Officer for Spotlight Asset Group. Welcome, Jason. Jason: Of course, and Aaron, before we get into talking about my background, just one note on what you said about most people choosing an advisor based on what they hear from the advisor. I’ll go one step further: they’re in front of that advisor because someone had referred them to them and they kind of just go with the flow and I hopefully this podcast will help people be a little bit more thoughtful and diligent about choosing an advisor since it’s such an important decision. But in terms of my background, I’m an attorney by trade. I spent all of my adult professional life in public service including the first 13 years of my legal career at the United States Securities and Exchange Commission. When I was at the SEC, I worked in the Division of Enforcement where I investigated and litigated cases involving broker dealer misconduct, investment adviser fraud, hedge funds, and private equity, municipal bonds and public pensions, among other things. Aaron: Why we’re doing this podcast is, it’s a complicated world out there. Employees used to get pension plans from their companies and now there’s 401(k)s, so employees have to provide for their own retirement. There’s also complicated terminology and job titles. So, as a client you’re in control, but it’s your responsibility to yourself and your family to make the right decisions and so you’re going to help us with that today, Jason. Let’s start with terminology. What’s the difference between a broker and an investment adviser? Aaron: What is the difference in obligation between a broker and an investment adviser? Jason: Well, when I say that there’s a different obligation, I mean that they’re held to different standards, legally. For a broker, they’re held to what’s called the suitability standard. What that means is that a broker simply has to have a reason to believe that a particular investment, for example the purchase or sale of a stock or a bond, is suitable for that client, given that client’s individual circumstance, their age, their net worth, and other factors like that. It doesn’t take anything else into consideration. For an investment adviser on the other hand- investment advisers are held to what’s called the fiduciary standard, which is legally a higher standard and it’s a legal obligation of the investment adviser to act as a fiduciary for their client. Aaron: So, an investment that is suitable isn’t necessarily the best investment for a client. It’s just suitable, whereas a fiduciary really needs to pick the absolute best, in that adviser’s opinion, the absolute best investment for the client. Jason: Correct. For example, a broker can recommend a trade for a client even if that trade happens to be better for the broker in terms of commissions and his firm versus it’s absolutely the best thing for the client. Whereas an investment adviser, the fiduciary duty is an obligation, a legal obligation for an investment adviser to act in the client’s best interest, and what that means is to always be putting the client’s interests ahead of the adviser’s interest. Aaron: That’s a pretty big difference. Jason: It is a big difference, Aaron, and you know what? It all boils down to conflicts of interest and disclosure, which is important to the client. For the broker’s side, like we said, it just needs to be a suitable investment and the broker is under no obligation to disclose the exact compensation fee he’s receiving that relates to the trades that he’s recommending. And for the adviser, that fiduciary standard means that they have a legal obligation to not only disclose any conflicts of interest to you, but to avoid those conflicts to the fullest extent possible and really that’s the difference. That’s a big difference for an investor, in terms of being able to understand the reasons and motivations behind a trade recommendation from their broker or from their investment adviser. Aaron: There are a lot of other titles out there. What other titles do investment professionals use and what do they mean? Aaron: And another way a client can figure out the difference between a financial advisor and a financial wizard is how they’re compensated. Can you tell us a little bit about the different ways that advisors /investment professionals make money? Aaron: Investment advisers who charge a fee- they’re making more money as their clients make more money, so they’re almost incentivized to do well for their clients because they’re on the same side of the table. Jason: Exactly. It’s critical… understanding the compensation structure is critical and understanding the conflicts that they may have. For example, a broker and the commissions they may be receiving or how their interests may or may not be aligned with yours. For example, that advisory fee and like you said, it’s a situation where you make money, we make money kind of thing. Where the interest is aligned, and the adviser wants to see your account grow not only because they are a fiduciary and act in your best interest, but what’s good for the client is what’s good for the investment adviser. Aaron: For a client then, it all comes down to understanding how your advisor is compensated and it really all comes down to transparency. Jason: Exactly Aaron. At Spotlight Asset Group our three guiding principles are transparency, technology and total wealth, and we have transparency in there because of its importance. We think clients should understand where potential conflicts of interest may be and understand that this is their money and it’s their family’s future. So, they should be understanding what they’re getting, what it costs, and they should be able to effectively monitor what their adviser is doing for them and that’s only done through a completely transparent process. Aaron: We had an overview of job titles and how people are compensated, the difference between suitability and the fiduciary standard. Now, let’s get into some questions, Jason, about what clients should ask either their potential advisers or their existing advisers if they already have one. Jason: I think those first issues we covered are paramount. One, what is your role? Are you a broker? Are you an adviser? What’s your obligation to me? How are you compensated? I think those are very important questions. In addition to those, clients also need to understand the services that are offered, and how those would benefit the client, and how much they would cost. So, ask your potential adviser that. Ask them what they do, ask them how they can work for me and how much it’s going to cost me. And the other thing to keep in mind when you’re asking these questions is that different advisers do different things. They provide different services. Some do financial planning, some don’t do financial planning. Some are strong on the investment side, some aren’t as strong on the investment side. The last area clients need to focus on is the adviser’s investment philosophy and their approach. Different advisers have different philosophies on how they approach the markets and trading and how they’re going to handle the clients’ accounts. I think that’s important to make sure that you as a client are on board with what that adviser’s approach is. Aaron: What questions should clients ask about the team surrounding that adviser? Jason: Well, that’s a great question because there are a lot of investment advisers- it could be a one-man shop, it could be a couple of people, or could be a huge team and that’s important because it relates to the level of service you might get. If it’s just one person you really need to make sure that they know what they’re doing, that they can handle the workload, and they can handle all the things that you need. So, ask that question. You’re sitting in front of the adviser, say, “Who else is working for me? Who else do you have on your team? Are you leveraging other companies that you use to do your back office or do your research for you or do all the administrative stuff, so you can focus on me and my needs in terms of financial planning and investment management?” So, find out who those people are and find out what they can do and what they can do for you. And it also kind of brings up the point of, if you’ve just got one person who is your investment adviser, what happens when you can’t get in touch with that person or something happens to that person. What happens to your account? What happens to your investments? Aaron: What happens if they get hit by the proverbial bus? Aaron: It’s important for clients to ask these questions, but it’s also important for clients to do their own due diligence and to do some research on the adviser and the team and the company they’re potentially hiring. What kinds of research should clients do to make sure that they’re hiring the right person? Aaron: We’ll put the links to some of those websites in the show notes so clients can research their adviser and the company they work for. What about certifications? There’s CFA, CFP. What do those mean and why are they important? Jason: Yeah, there’s an alphabet soup of certifications and licenses that are out there. Whether you’re a broker and you have your Series 7 or Series 65 and 64 and all these different things, if you’re looking at particular broker and you don’t understand what those certifications and qualifications are, I would urge you to look them up. When you see that someone is a CFA, which means that they are a Chartered Financial Analyst, or they’re a CFP, a Certified Financial Planner, you need to look that up and see what that means. Generally, what it means is, as with most certifications is that they have taken on an additional level of education and training to give you better advice or to understand the advice they’re giving you in the first place. So, there’s a lot of different ones that are out there, CFA and CFP being the main ones but if you see something, do some research on it and see if that’s important, if that qualification is important to you and the services you’re looking for. Aaron: Yeah, I think a lot of what we’re getting at here is that people need to ask a lot of questions and don’t be afraid to ask questions. Ask hard questions because if the person you’re interviewing can’t answer those, maybe that’s a red flag. And if the advisor you have had for years can’t give you straight answers, that could be a red flag. So, talking about red flags, moving into red flags- Jason, you were a SEC Enforcement Attorney for 13 years. What are of the red flags people should be looking for when they’re interviewing a potential adviser or talking to their existing adviser? Jason: Aaron, I think you mentioned the biggest red flag, is if you’ve done your homework and you’re sitting down with a potential adviser and they’re hesitant to answer questions or you’re not comfortable with the questions or the answers they’re giving you. I think that in itself is a red flag and you should be wary of that and your antenna should just kind of stick up in that situation. This is a relationship. You’re exploring a potential relationship and it’s an important one. Outside of your family and your closest friends, a financial advisor can be a lifelong relationship for a lot of people and it’s important that you are comfortable with that person, that you trust that person, and that you understand that person in terms of their motivations, their processes, and their capabilities. And so that, I think is probably the biggest red flag to watch out for, is if you have someone who’s not being forthright with you and you think that if you have a bad feeling about it, you feel like they’re hiding something or feeling they’re just not being very direct and honest about how they’re answering your questions, then I think that you need to ask more questions. And if you’re getting a bad feeling about it, move on. There are lots of advisers out there, there’s lots of qualified great people out in this industry that are more than willing to help you. Aaron: For people who have existing relationships with an adviser, what red flags should they be looking for? Jason: That raises a great point. Once you get an adviser and you’re comfortable with them and you trust them, and you get set up in a process, your obligations as a client don’t end there. I think you have an ongoing obligation to continue managing that relationship, so to speak. If your circumstances change either financially or with your family, you need to let your adviser know so they can take that in consideration when they’re making investment decisions for you. The other thing you have an obligation to do is review your statements whether you’re getting that monthly, or quarterly, or whenever. When you get a statement from your adviser, you should be taking a look at it. Make sure that the transactions that are shown and reflected in that statement match what you discussed with your adviser or your broker. If you have a discretionary account with an investment adviser, take a look at what the performance is and what the fees are that are coming out of that and make sure it tracks with what your understanding of the relationship was and what you think should be going on. If there’s something in that statement that stands out while you’re scrutinizing it or that just confuses you and you’re unsure of, you should definitely speak up. You need to reach out to your adviser or whoever your contact is at the firm and ask them about it and they should be happy to discuss it with you. They should be available, they should be willing, and they should be candid about anything that you don’t understand in those statements and they should be able to explain what they’ve done in a way that you understand and are comfortable with. And if they can’t, again, that’s another red flag. Aaron: Jason, you used the word obligation several times in that last answer and it’s important for people to understand that they have an obligation. This is a relationship. It’s not one way. You don’t just handle your money to the adviser and hope for the best. It’s your obligation. It’s your money, it’s your future. You need to make sure that you understand what you’re doing, what the adviser’s doing, and follow up. Do the research, make sure you’re getting what you’re paying for. So, Jason, any final thoughts? Jason: No, I think just that Aaron, you know, It’s a two-way street. You can sit down with your adviser and set them up and have them manage your investments and never check in. If that’s what you want to do, that’s fine, but I think again, you still have those obligations to check your statements and make sure things are going as you expect them to. And it’s again, like any other relationship, the more you put into it, the more you’re going to get out of it, the more you stay in touch with your advise r and inform them of your situations and your goals and the changes to those situations or goals, the better they’re going to be able to serve you and the better the relationship is going to be in the long run. Aaron: Thanks Jason, this is really valuable information that I hope everyone takes to heart, so I appreciate you being on our podcast today. Jason: Thank you Aaron, thanks for having me. Aaron: Thank you for listening to episode #2 of the Spotlight On Your Wealth Podcast. You can subscribe to our podcast on Apple iTunes, Google Play, and Spotify to get these podcasts automatically on your listening device. So, for Jason Howard and Spotlight Asset Group, this is Aaron Kirsch. Thanks for listening.